Old Wisconsin is giving away more than ever during the Rediscover Real Flavor Sweepstakes! From September 4–February 28, enter for a chance to win great prizes from your favorite retailers and receive super savings on your favorite Old Wisconsin snacks. Click to find them at select convenience stores and/or retailers near you. 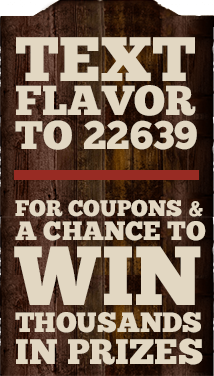 Snack your way to savings and incredible prizes, text FLAVOR to 22639 for your chance to win! NO PURCHASE NECESSARY. Sweepstakes begins at or about 12:00 PM ET 9/4/18 and ends at 11:59:59 PM ET 2/28/19. Sweepstakes consists of 6 entry periods. Open only to legal residents of the 50 US/DC who are 18 years or older. Click Here for Official Rules, including how to enter, free method of entry instructions, odds, prize details and restrictions. Void where prohibited. Msg&data rates may apply. Consent not a condition of purchase. Text HELP to 22639 for help. Text STOP to 22639 to cease messages. Sponsor: Old Wisconsin Sausage, Inc.